Black Cow Vodka is opening its Dorset distillery to the public in April 2017 with tastings, cocktail classes and lunch in the new Black Cow Bar and Kitchen. 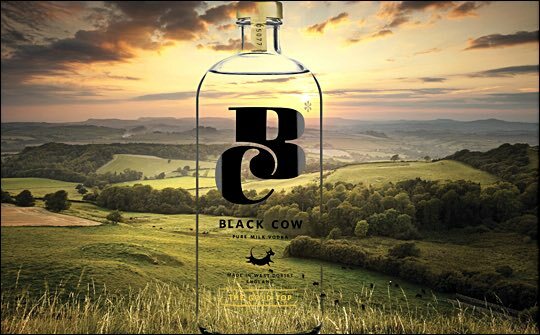 Black Cow is a super-premium vodka, distilled from the whey of milk and treated to “a secret blending process” created by dairy farmer Jason Barber. His inspiration came from a desire to diversify the produce from his 250 strong dairy herd and his personal interest in vodka. Black Cow was launched by Jason and creative Paul Archard in 2012. There are two tiers of experience on offer: The Black Cow Distillery Experience and The Black Cow Distillery Visit. During The Black Cow Distillery Experience, which lasts three hours, visitors will experience a cocktail making class, a tour of the distillery and lunch in the new Bar + Kitchen, where they will be able to sample the unique spirit distilled from pure milk and enjoy lunch consisting of locally-sourced, seasonal ingredients. Visitors will leave with a complimentary bottle of Black Cow Vodka. Advance tickets are available for an introductory price of £140 for two people from the Black Cow website: This experience is bookable on Fridays and Saturdays from April 2017, for a maximum group size of 8 people. The Black Cow Distillery Visit, priced at £25 per person and lasting approximately 60 minutes, gives visitors a tour of the distillery, a chance to sample the vodka and enjoy a complimentary cocktail, while learning about Black Cow. This is for a maximum group size of 10 people and is available on Fridays and Saturdays from April 2017. Black Cow Vodka 40%ABV has a RRP from £31.75 for 70cl and is distributed in the UK by Mangrove.